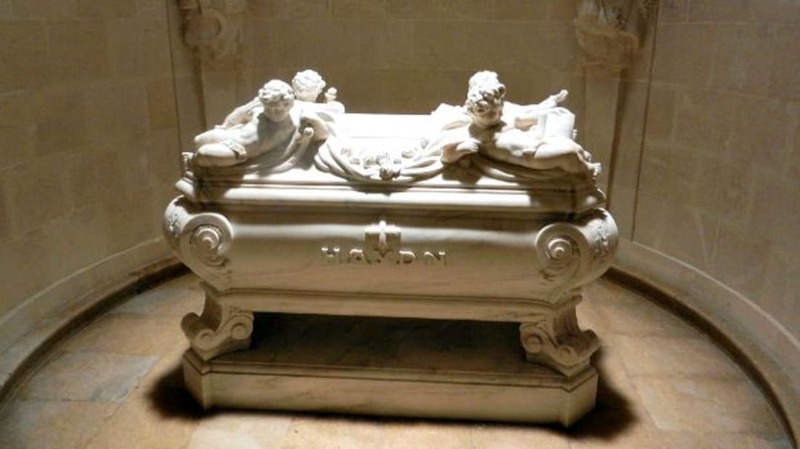 Why Does Haydn's Tomb Contain Two Skulls? Just days after composer Joseph Haydn died in 1809, grave robbers broke into the cemetery and opened his coffin. Unlike other cemetery thieves, they weren’t interested in removing jewelry or other valuables—they simply wanted Haydn’s skull. So why are there two heads in his tomb now? A couple of Haydn's pals, Joseph Carl Rosenbaum and Johann Nepomuk Peter, paid a gravedigger to give them access to their friend's head, claiming that they wanted to "protect it from desecration." In reality, the pair were avid believers in phrenology and wanted to see if the composer's skull was as developed in musical areas as expected. Not content to just "scientifically" examine the head, Peter had a black cabinet made for it and proudly displayed the curiosity in his house. At one point, he transferred ownership over to Rosenbaum. The whole affair might have gone unnoticed had Haydn's former patron, Prince Nikolaus Esterhazy II, not decided to give the composer a proper burial more than a decade after his death. When Haydn was exhumed from his previous resting place, it became quite apparent that his head had gone MIA (his wig was still there, however). Esterhazy's investigation led to Rosenbaum and Peter pretty quickly—it seems they were fond of showing off their unusual specimen—and Rosenbaum reluctantly produced a skull. Because doctors could see that the skull belonged to an older man, they accepted that it belonged to Haydn, who died at the age of 77. It didn’t. The truth came out not long afterward, and police were sent to Rosenbaum’s residence to confiscate the goods. Tipped off to the search, Rosenbaum's wife hid Haydn's head in her straw mattress. When officials came to search her room, she informed them that she was bedridden because she was “having her days,” and they would have to leave. They did. It took nearly a century and a half, but after 145 years, Haydn’s skull and his body did eventually meet again. After Rosenbaum and Peter had both passed away, the head changed hands multiple times before finding its way back to the Esterhazy family, who held a ceremony to reunite the composer's remains. Of course, by this time, no one knew where the other skull had come from, so they just left it where it was—and now you know why Haydn's tomb contains two heads.